We’re happy to be hosting P.I. 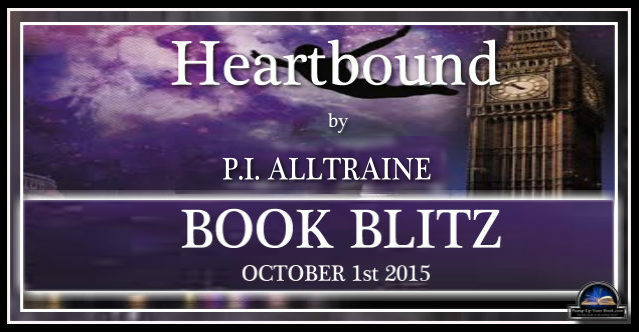 Alltaine and her HEARTBOUND Book Blitz today! Petyr has never found it necessary to consider the humans as anything more than distant, inferior beings–until now. They are the cause of the fatal disease that has plagued his realm, taking the lives of too many of his kind. As a future leader of a realm in peril, Petyr must find a way to resist and cure the affliction. He must enter the unfamiliar realm, appear to be an ordinary eighteen-year-old human, observe, and learn. However, things don’t exactly go according to plan. Instead of embarking single-mindedly on his sober mission, Petyr meets an 18-year-old girl who does things to his emotions that he can’t quite fathom or control. Petyr is falling in love, and he almost forgets the gravity his choices have on his entire world. Despite the risk it poses to his life and hers, he wants to know her, and he wants her to know him–and his world. Heartbound is available at Amazon. Watch the trailer at YouTube. I defied my fate the moment I leapt out of my apartment’s third-story window. I landed on the pavement without a sound. In the same instant, my feet blended into the measured pace in which humans carried themselves. Gazing up at the sky, I tried to find something to remind me of my home, of my duty. The future leader of a realm in peril cannot be overcome by irrational desires, I thought. Thick smoke obscured the heavens so much even the brightest stars were dull and barely visible. A reminder I was trapped in this city, in this realm. Too far away from everything I knew, too restrained, too human. Through the chaos in my mind, I captured the image of the girl with brown and dark-auburn tones in her hair, the shine that bounced from her loose curls, the depth in her hazel eyes, and even the awkward half-smile when she caught me looking at her. But the memory wasn’t enough. I needed to see her again. I kept walking until I reached the riverbank in the heart of London. The water rippled with a disheveled mesh of gold and red, reflecting a large architectural structure. My gaze lingered on the clock tower adjacent to the building, gauging its height. A temptation to feel even a fraction of my true nature became a need in every fiber in my body. No longer able to rationalize, my muscles coiled, and I let go. Wind enveloped me with its familiar warmth as I sprang across the River Thames. I aimed to land on the lower portion of the tower, to indulge in the pleasure of my ascent. Though too fast for human eyes, each maneuver, each somersault, each back flip was slow enough for me to savor every moment of my liberation. On a part of the roof concealed from the passersby below, I was closer to the heavens than I’d been since arriving in the city. Still, I didn’t belong here. Hundreds of lights sparkled below me, each representing a life I didn’t comprehend. Allowing myself to break free from my human façade had made me a liability to the others. For a few moments of freedom, I let myself forget the importance of my purpose here—the lives that depended on it. Somehow, having the girl’s image in my mind brought calmness within me. One that felt permanent. One that extinguished the sense of entrapment, despite the thick layer of smoke that was still very visible to me. I held on to the calmness as I regained the confidence to face the others. Her latest book is the YA fantasy romance, Heartbound. Connect with P.I. on Facebook and Twitter. Find out more about P.I. at Goodreads. Posted on October 2, 2015, in Guest Authors and tagged @pialltraine, Book Excerpt, Heartbound Book Blitz, P.I. Alltraine, Pump Up Your Book, PUYB. Bookmark the permalink. 1 Comment.